The concept of laboratories coming together under one umbrella, as the International Consortium of Gem Testing Laboratories has caught the imagination of several leading laboratories and institutions. formation and knowledge is the key to be successful in a business which develops rapidly and constantly.” Hence, formation of ICGL is undoubtedly a wise move and Gübelin Gem Lab is ready to help wherever they can. Dr. Jack Ogden of Gem-A was also very impressed by the idea which began in the month of December 2012, seven gemmologists from different corners of the world, viz. 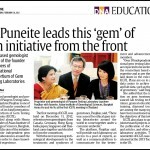 from Canada, Germany, Hong Kong, India, Japan, Singapore and Thailand, got together to form the International Consortium of Gem Testing Laboratories. 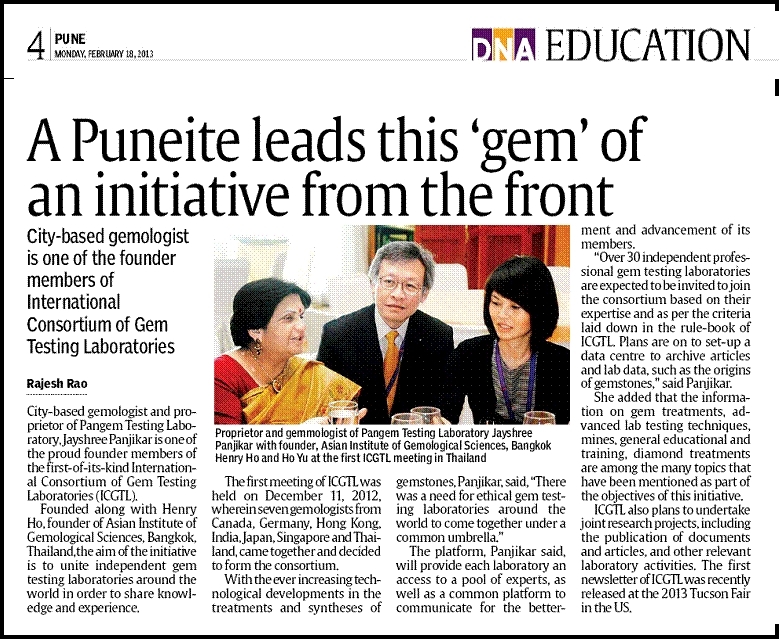 This International Consortium was initiated by Dr. Jayshree Panjikar and Mr. Henry Ho, and aims to unite independent laboratories around the world, in order to share and exchange knowledge and experience. In doing so, the ICGL would be providing each laboratory an access to a pool of experts, as well as a common platform to communicate for the bet­terment and advancement of its members. About 30 independent professional gem testing laboratories are expected to be invited to join the consortium based on their expertise and as per the criteria laid down in the rule-book of ICGL. A data centre is expected to be set up to archive articles and lab data, such as the origins of gem stones. The latest information on gem treatments, advanced lab testing techniques, mines, general educational and training, diamond treatments are among the many topics that have been mentioned as part of the objectives of this initiative. The purpose of ICGL is to promote excellence in the field of gemmology, and to reach out the final customer by providing reliable sources as an alternative to the plethora of misleading information available today, in particular on the internet. Besides, the ICGL plans to undertake joint research projects, including the publication of documents and articles, and other relevant laboratory activities. Accordingly the first Newsletter of ICGL, where in important issues like synthetic diamonds, jade and identification of treated and synthetic yellow sapphires were elaborated, was released at the 2013 Tucson Fair by Branko Deljanin in the USA.